A safety invention geared to selling more bike helmets, with an ingenious form of planned obsolescence. You can’t fault Dr. Christof Koplin for a lack of imagination. An engineer at Germany’s Fraunhofer Institute for Mechanics of Material–a clearinghouse for future-forward inventions–Koplin invented a type of foam that actually stinks when it’s cracked. The benefit? Koplin suggests bike helmets that tell you when it’s time for a new one. Here’s his logic: Bike helmets are supposed to be replaced anytime their foam has been cracked. If you drop a helmet, or own it for a long time, it might actually need to be replaced because of microfractures inside of it–so while it might not obviously be cracked, its structural integrity could be shot. Koplin’s invention consists of foam that’s been impregnated with microcapsules filled with smelly oils. Once cracked, the oils ooze out. The bigger the crack, the stinkier the helmet. All of which sounds amazing–a helmet that tells you when it’s broken! Via your nose!–but hold up. It happens that helmet foam has already been engineered with this replacement problem in mind–that’s why when you really hit a helmet, the foam doesn’t just chip or ding. It shatters, rendering the helmet unusable. But I’m not so sure that the mere breakage of a few capsules amounts to a reliable indicator that the entire helmet is kaput. Helmets build up plenty of tiny cracks and dings over time. They might still be good if those cracks aren’t structured in a way to propagate. A mere dent isn’t going to kill you. But with Koplin’s invention, a helmet might actually stink even though it does not need to be replaced. Which makes me think: The real use of this invention is probably to sell more bike helmets. 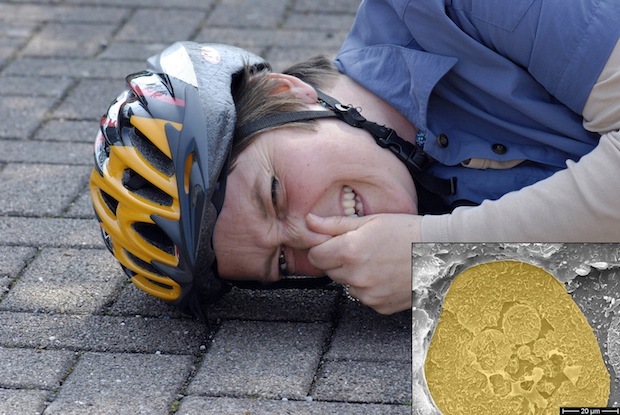 I mean, what’s to prevent a bike-helmet maker from designing helmets to stink at the very slightest impact? Then you’d have essentially a new form of planned obsolescence–something the world definitely doesn’t need. Koplin, for his part, has other, more serious applications in mind–like using the capsules in water and gas pipes, which typically can’t be seen (smell detection is already used in metal pipes but not plastic ones). All of which sounds a bit more reasonable than a bike helmet.